Date: Sat. Feb 23, 12:00-5:00; Sun. Feb 24, 10:00-3:00. Investment: $175 for 2 days or $100 for 1 day. CASH ONLY or arrange payment with Steve Smith at the contact information provided. 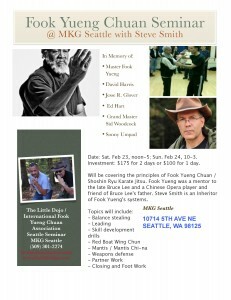 Will be covering the principles of Fook Yueng Chuan / Shoshin Ryu Karate Jitsu. Fook Yueng was a mentor to the late Bruce Lee and a Chinese Opera player and friend of Bruce Lee’s father. Steve Smith is an Inheritor of Fook Yueng’s systems.